Photo of Mary Soon Lee courtesy of the author. Terrie Leigh Relf: What kinds of writing have you done? Mary Soon Lee: Once upon a time, I wrote science fiction and fantasy short stories. When my second child was born, I switched to poetry, because it fit into my schedule more easily. For the past three years, I’ve been working on The Sign of the Dragon, an epic fantasy presented in narrative poems, part of which may be read by clicking on the link. Terrie Leigh Relf: What is your area(s) of subject matter expertise? How did you discover this niche? Mary Soon Lee: Growing up, I read widely, but especially loved science fiction and fantasy. My writing began with those genres, then moved to mainstream poetry. In 2013, I wrote a handful of fantasy poems. One of the characters took hold of me, and I spent the next three years writing his story. Terrie Leigh Relf: What tips do you have for other writers? Mary Soon Lee: I think every writer varies, but I have found it very helpful to start my day working on first drafts, then do other tasks – revisions, submissions, grocery shopping, the family laundry, etc. – as needed. I would advise new writers firstly to write what you love, and secondly not to be discouraged by rejections. Terrie Leigh Relf: Where do your ideas come from? Mary Soon Lee: Alpha Centauri. Seriously, that’s a very hard question to answer. Often I don’t know where the idea came from when I’m working on a piece, and only realize afterward, if ever, what led me down that path. At times, music helps me (when I am thinking, not when I am actually writing). I also jot down random ideas when I have them, and then look through my idea-list when I’m wondering what to work on next. In the case of The Sign of the Dragon, the characters and the narrative directed my writing. Terrie Leigh Relf: Where have you been published? Upcoming publications? Awards and other accolades? 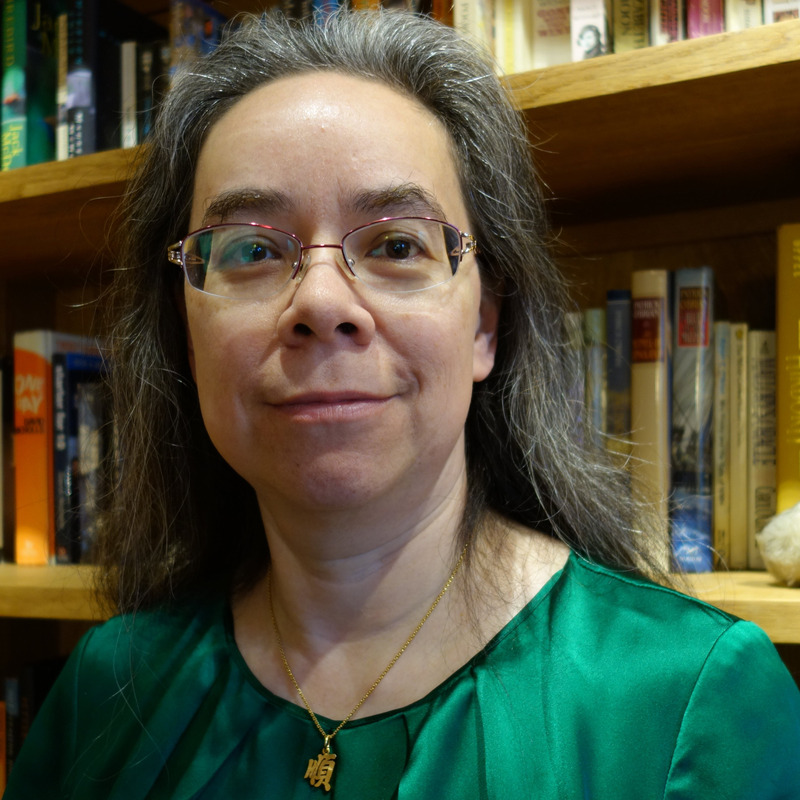 Mary Soon Lee: I have won the Elgin Award and the Rhysling Award for my poetry. The start of my epic – “Crowned: The Sign of the Dragon, Book 1” – was published by Dark Renaissance Books in 2015. My poems have appeared in places ranging from American Scholar, to Heroic Fantasy Quarterly, to the Pittsburgh Post-Gazette. I’ve also won the Best of Soft SF Award for a short story that appeared in Interzone, and my short story credits include Analog, F&SF, Lightspeed, Sword & Sorceress, Year’s Best Fantasy, and Year’s Best SF. Terrie Leigh Relf: What are you working on now? Mary Soon Lee: I finished working on The Sign of the Dragon last weekend, and haven’t yet decided what major project to work on next, but I did write ten science fiction poems during the week. Terrie Leigh Relf: What challenges have you faced as a writer and/or with a particular project? How did you meet them? What did you learn from these challenges and how did they make you a better writer and/or editor? Mary Soon Lee: My main challenge has been lack of time, a problem that was worse when my children were little. In the four years following my daughter’s birth, my output averaged eleven poems per year. I almost wasn’t writing at all. I’m not sure it did anything to make me a better writer, but I wouldn’t change it. Terrie Leigh Relf: Are you plotter or a discovery writer? Mary Soon Lee: I usually begin a piece as a discovery writer, but if it is longer, I become a plotter as it progresses. The Sign of the Dragon is 94,000 words long and entailed much plotting, including persnickety details such as working out how long it would take my characters to get from A to B, or when there would be a full moon. Terrie Leigh Relf: Who are your favorite characters? How did they come into being, and what do you love about them? Mary Soon Lee: In August 2013, I wrote a poem about a 16-year-old prince waiting for one of his older brothers to be picked as king following their father’s death. The poem came out of nowhere, out of impulse, out of the delight of writing fantasy again. That boy, Xau, became my obsession for the next three years. I love that Xau is a king who doesn’t want to be king, yet is determined to do what he believes to be right, no matter the cost to himself. I love that his guards become closer to him than brothers. I love that he would rather talk to his elderly cleaning woman than his ministers. My other favorite characters are the dragon in Xau’s story and his guard Li. Terrie Leigh Relf: Are you currently, or have you ever, been in a writing group? Your thoughts? Mary Soon Lee: When I moved to Pittsburgh, I started a writer’s group called the Pittsburgh Worldwrights and ran it for about ten years. I found it very helpful, both in improving my fiction and in being part of a community of writers. I think it’s important not to argue with the critiques you receive, but instead simply thank the critiquer. It’s also important for the writing group to ensure that the critiques don’t cross the line between critiquing the work and critiquing the author. Terrie Leigh Relf: I know our readers would love to hear about your networking, marketing, and promotional experiences – including tips. Mary Soon Lee: For the ten years following my second child’s birth, I spent almost all my writing time alone at my computer, and very little at readings, conferences, etc. In the past couple of years, I’ve been to three conventions a year (Worldcon, World Fantasy Convention, and Confluence), and have also been to poetry events here in Pittsburgh. It might well be useful to spend time on Facebook or Twitter, but I am worried about how many hours they would eat up, so I have accounts on neither. I love the Goodreads website and I am a Goodreads author. Reading is still my first best love for my free time. Terrie Leigh Relf: Thank you for creating time for this interview, Mary. Be sure to read her new collection. You can purchase Crowned: The Sign of the Dragon Book 1 from Dark Regions Press, or from Amazon.